The challenge of solving the Synoptic Problem is a bit like trying to reconstruct the events of a multi-vehicle traffic accident. With an accident there are various bits of data like skid marks, damage to street furniture and damage to the vehicles themselves. The task of the reconstructor is to find a way of accounting for all these skids, dents and knocks within a coherent overarching story. Sometimes Luke and Matthew are almost identical for extensive passages. The best explanation for this is that Luke copied Matthew or that Matthew copied Luke. Sometimes Matthew looks more 'primitive' than Luke, and sometimes Luke looks more 'primitive' than Matthew. This is very unlikely to happen if Matthew was simply copying Luke, or if Luke was simply copying Matthew. If Luke used Matthew then he treated Matthew in a way that is difficult practically, unprecedented historically, and which is entirely unlike his treatment of Mark. This suggests that Luke did not use Matthew. Is there a coherent story that can account for these, and various other, factors? My solution is the Matthew Conflator Hypothesis - which argues that Matthew used Luke directly (satisfying data points 1 and 3) while also sometimes conflating Luke with Luke's own source (satisfying data point 2). A series of short videos explaining this theory is available here. 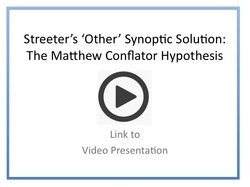 The Matthew Conflator Hypothesis generates a fresh conception of the hypothetical entity 'Q' which, in turn, introduces the possibility that instances of 'Q' may, after all, be extant. Videos presenting an 'An Extant Instance of 'Q'' are available here. Contact me if you would like me to present at your university, meeting or conference. Heard [one] of [the] most scintillating papers of my life, tonight, by Alan Garrow on the Synoptic Prob. His Matt Conflator Hypothesis makes sense.